For anyone still undecided on what to buy as a last minute Christmas present, a cycling helmet may turn out to be much more than a gift, it could be a lifesaver. That proved to be the case for a man in Bomere Heath this morning after he collided with a gate post after being thrown over the front of his handlebars whilst cycling with a group of friends. West Midlands Ambulance Service was called to the incident near to The Hayes Farm Junction, at 11.15am this morning. Two ambulances were sent to the scene. A surgeon who lived nearby was also on hand and had already starting treating the patient when crews arrived. A West Midlands Ambulance Service Spokesman said: “On arrival, crews discovered a man, believed to be in his 50s, who had collided head first with a stone gate post after being thrown over the handlebars of his bike. 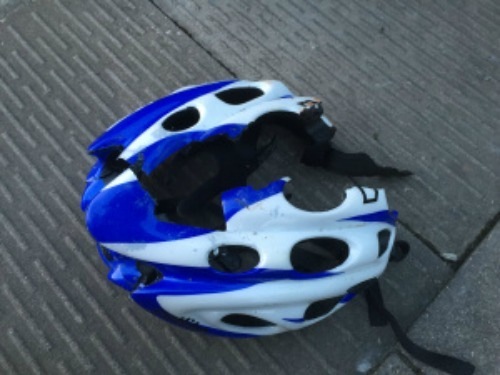 His helmet, which had split into two as a result of the impact, was nearby. “Following assessment from ambulance staff he was treated for a cut to the head and a back injury, but medics on scene were left in no doubt that his decision to wear a helmet saved his life due to the severe nature of the impact. “He was then transferred to Royal Shrewsbury Hospital for further assessment.